Marriage is an institution which can join together people’s lives in a variety of emotional and economic ways. Describe cohabitation trends in the U.S.
Cohabitation is an arrangement where two people who are not married live together in an physically and emotionally intimate relationship on a long-term or permanent basis. Over the years, evidence indicating cohabiting increases the likelihood of split has always been more prevalent than evidence that suggests it is helpful. Cohabitation in the United States became common in the late 20th century. Some places, including the state of California, have laws that recognize cohabiting couples as ” domestic partners “. cohabitation: An emotionally and physically intimate relationship that includes a common living place and which exists without legal or religious sanction. Domestic Partners: Two individuals who live together and share a common domestic life but are neither joined by marriage nor a civil union, yet may have other legal guarantees. Likelihood of Split: The probability that a romantic union will dissolve. Marriage is an institution which can join together people’s lives in a variety of emotional and economic ways. In many Western cultures, marriage usually leads to the married couple living together in the same home, often sharing the same bed. In some other cultures, this is not the tradition. Conversely, marriage is not a prerequisite for cohabitation. Cohabitation is an arrangement where two people who are not married live together in an physically and emotionally intimate relationship on a long-term or permanent basis. 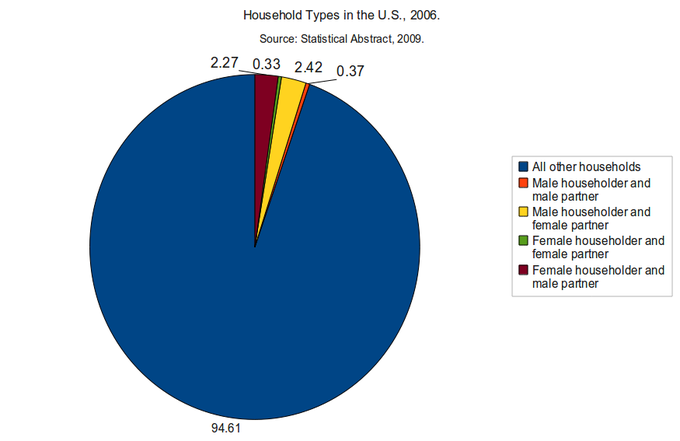 Household types in the United States in 2006: This figure shows that roughly 5% of households in the United States are made up of cohabiting couples of various types: heterosexual, gay, or, lesbian. Conflicting studies on the effect of cohabitation on marriage have been published. But over the years, evidence indicating cohabiting increases the likelihood of split has always been more prevalent than evidence that suggests it is helpful. For married couples, the percentage of the relationship ending after five years is 20%, for cohabitators the percentage is 49%. The percentage of the relationship ending after 10 years is 33% for married couples and 62% for cohabitators. Cohabitation in the United States became common in the late 20th century. Although it is illegal in five states, a total of 4.85 million couples live together. A scientific survey of over 1,000 married men and women in the United States found that those who moved in with a lover before engagement or marriage reported significantly lower quality marriages and a greater possibility for splitting up than other couples. About 20% of those who cohabited before getting engaged had since suggested divorce, as compared with only 12% of those who only moved in together after getting engaged and 10% who did not cohabit prior to the marriage.